Gonna mix it up a bit with this post, and go video on ya. In this demonstration, we use a Pro Res timeline in Final Cut Pro, send it to Avid without creating any new media, and have the sequence not only open, but also utilize the same media – all using Automatic Duck & Avid’s AMA feature in 5.0 – via a hidden (undocumented) trick! Special Thanks to Avid (Casey Richards), Automatic Duck (Wes Plate), Telestream, Apple, and Key Code Media. Update: 11/11/10 Wes Plate of Automatic Duck, has updated Pro Export FCP to 4.05, and has a video to go along with it! project is SD mixed NTSC (90%) and PAL (10%). 1. what is the right order to do things in: if i am moving a project from FCP to AVID for continued off-line editing (we’re talking about a rough-cut that still needs to have all the other media accessible and not only those master clips associated with the timeline i am converting. a. should we first open a new project in AVID and link to the quicktime media and then open the converted timeline? or should we first open the project with the converted timeline and then link to the media? 2. we will be copying all current media to a new drive, we’re thinking of a G-Raid 4TB running either firewire 800 or eSATA to my macbook pro, any feedback on this? 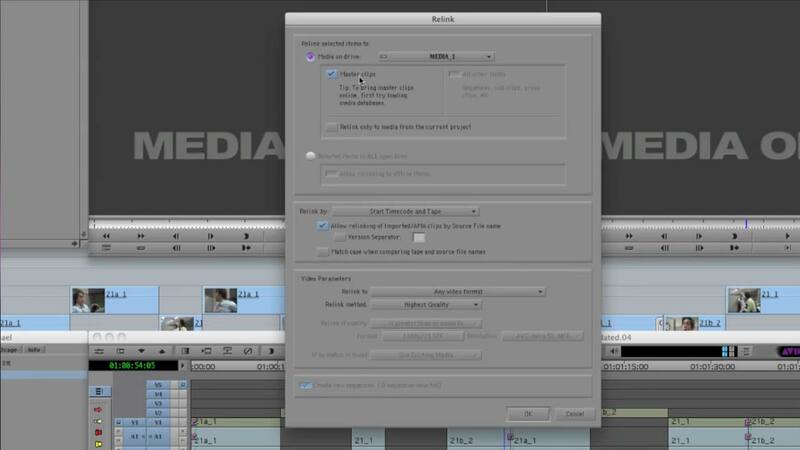 3. need i upgrade the project to FCP 7 before exporting to AVID 5? 1. Automatic Duck creates an AAF file. An AAF file is not an Avid project file. Thus, I would create an Avid project, based on your sequence preset in FCP, then import the AAF into that project. Once the AAF is imported, then do the re-link trick as outlined in the video. 2. You should be fine, provided both Avid and FCP are on a Mac. If not, then the drive may not be formatted to work on Mac & PC effectively. Macs (HFS) can read PC (NTFS volumes) but cannot write to them, PCs (NTFS) cannot read or write to Mac disks (HFS) natively; you would need 3rd party software – like Mac Drive – to accomplish this. It also decreases performance slightly. eSata willl be faster than firewire 800. 3. Your best bet is to contact AD and make sure FCP 6.01 is supported in AD 4.x. You m,ay need an older version of AD, which they can provide. AD also has some videos showing the basic timeline movement from FCP to Avid here: http://automaticduck.com/products/pefcp/ . Look at the top right of the screen. I was very interested to see this, but have not managed to get it to work myself. It would appear that Avid wants to link to AMA files based on “source file”, but an AAF generated by Automatic Duck from FCP does not seem to put anything into the “source file” column. And AMA files have no tape name, so you can’t relink based on that. I’m not surprised that you’re having issues. What I’m doing is undocumented and unsupported. It just HAPPENS to work! My experience has been that some QT files just don’t relink. Sometimes the QT files were created by an encoding solution which doesn’t include enough metadata for Avid to be able to relink to. Therein may be the issue you are seeing. The fact you need to enter source fields etc., tells me Avid is trying to relink via that metadata value. In my example, I do not believe I can using that particular metadata. I cannot swear to it, since I did not create the files. You MUST mount a file or folder that the AMA file resides in prior to attempting a relink. Otherwise, you have not TRICKED Avid into seeing that folder/file as a recognized AMA Volume / File. Check your import settings as well. Many errors that have been reported are dealing with improperly selected values in the relink window. Watch the video again and at about 2:45 or so, the import window opens. Copy those settings! I have a question. I have a full FCP project that I want to drag into AVID. It’s not only a sequence or two, it’s the bin/folder structure, log-notes, markers and so on. Is there any way to do this? Or how would you handle this operation? Thanks! Automatic Duck is your best bet. As of now, there isn’t a 100% foolproof translation from FCP to Avid, but Automatic Duck does get pretty close. Automatic Duck’s website lists what features transfer over, including transitions and what not. AD’s support is also very good, so I’m sure if you inquire to support as to what exact (be specific!) translations you need, they can address each one. Thank you for these videos. I am not very technically proficient, so I hope my question makes sense. Basically, I have a bunch of standard definition 10-bit uncompressed Quicktime files that were created in FCP 7 that I need to import to AVID 5.5. Can I use Automatic Duck to import these clips so that there is no import time involved? Because I’m being told that any clip I have in 10-bit uncompressed QT will take 3x the length of the clip to import into AVID. Also, I don’t have a Project created, I just want to get the media into AVID so the editor can create his own timeline, using the clips I’ve provided. Do I need to lay all the clips down in a FCP project file to use Automatic Duck to export them into AVID? Again, apologies if I sound like a total idiot. I sure do feel like one! Why on Earth do you have 10bit Uncompressed files? Unless you are doing some massive fx work, it’s overkill – big, bulky, and cumbersome, and expensive to use (storage, throughput, etc). Lets make sure our nomenclature is right. My video shows LINKING via AMA. LINKING is Best – no re-compression, and really fast. Importing means converting the file into an Avid codec, which is slow(er). If you can double click on the 10bit file on your desktop – and Quicktime plays it – than Avid 5.0+ on the same machine will understand it via AMA; i.e. Avid can LINK to it and use it. You should NOT need Automatic Duck for this. Be warned, however, Avid performance via AMA is not as good as doing a straight import. It’s a trade off. You can, of course, import it as well if you want maximum compatibility over the time it takes to complete. I recommend seeing if you can view the 10bit clip on the machine you’re going to run Avid on (in Quicktime). if you can, you;re in good shape. If not, you need to track down the codec that was used (AJA, Blackmagic, etc) and install it on your Avid machine. I hope you still assit with Auto Duck questions. When importing my audio tracks from Avid 5.5.3 to FCP 7.0.3 via AAF, FCP doesn’t import the sequence in exactly as it was in Avid. It’s just one clip that comes over fine but doesn’t show up in the FCP sequence. All other video and audio clips come over perfectly just this one music clip. It’s a 23.98 project. The clip is 23.98/48k/24bit AIFF_C (OMF) like many of the other clips that moved over fine.